It’s October 8th, 1988. It’s my first day working in television and I’m surrounded by around 70,000 people. Mistakes are made. Thousands of people are upset. What should have been a miserable day, turns out to be one of the best days of my life. Turner Broadcasting came to Tuscaloosa on a beautiful Fall weekend to broadcast the University of Alabama homecoming game against the Ole Miss Rebels. At the time, I had already abandoned one or maybe two other majors and was trying on the Communications department for size. Film and Television track to be specific. A week or two before, the Turner people contacted the department looking for production assistants for the game. People to help set up, break down and be gophers during the game. Sounded like fun and the fact they were going to actually pay us made it sound even better. We met the day before the game at Bryant-Denny stadium. Maybe 8 to 10 Communications students and the Turner crew. We all got cool TBS Sports t-shirts and some brief instructions. What to do, where to go, and a call for a couple of volunteers. Two of the students would be “in charge” of a sideline. One for Alabama. One for Ole Miss. I wasn’t even sure what was meant by “in charge” but I volunteered anyway. So did one other guy but for some reason I can’t quite remember, he was given the Alabama sideline and I was given Ole Miss. I was a little ticked about not getting the Tide side but I had to roll with it. The next day we get to the field a couple of hours before game time and starting setting up. At one point the TBS commentators for the game came down to the field and walked around checking things out and talking to us. I remember at the time being a little star struck meeting them. But now I can’t remember who they were. I need to look that up. It turns out the “in charge” duties were actually pretty cool, especially for a television newbie. I would be on headsets on a long cable (Not quite long enough. More on that later) and would be the on field communication to the booth and truck from the Ole Miss sideline. I wouldn’t be on-air but I would report back to the truck anything going on on the sidelines that was worth mentioning. Injuries and things like that. I did have one other thing I was responsible for. A seemingly simple thing. You know when the players burst out of the tunnel before the game and storm the field. Well for televised games, that needs to happen when the cameras are rolling and ready, so somebody actually has to “cue” them. Guess who. Earlier, while things were relatively calm, I got some brief instructions about releasing the Rebels. After the Tide is introduced and takes the field, the director would tell me to cue Ole Miss and they would take the field. Got it. Simple. We finish getting everything set up for the game. The stands are packed. The stadium is electric. It’s finally time to get this party started. I put on my headset and I feel like I’m on top of the world. Through the chatter of the director and camera operators, I’m told it’s time to get in position to cue the team. I start to head down to the corner of the field where the Ole Miss players are gathering and as I’m walking I feel a jerk and I’m stopped in my tracks. I turn and realize the cable is stuck. I walk back a little to un-stick it and discover the real problem. It’s too short. From the end of the cable, I’m about 20 yards from the Ole Miss players waiting on the field. Uh oh. Then I hear the introduction of the Crimson Tide. I can’t see the players but the crowd roars. As the roar dies down, the director tells me to cue the Rebels. I start waving my arms at the players trying to get their attention and telling them to go. It’s not working. I wave more frantically. Nobody sees me. The director starts yelling in the headset Go! Go!. I yell back that the cable is not long enough. I can’t get to the team. He screams back for me to drop the &*^%$!! headset and get the team on the field! I rip off the headset and run to the players. I grab the first guy and tell him to GO! The guy looks down at me with wild eyes and tells me they can’t go until the TV people tell them to go. I reach down and grab my shirt pulling up the TBS logo so he can see it and yell, I AM THE TV PEOPLE! GO! The team takes off and I’m almost trampled. I run back over and put on my headset and start apologizing. The director, somewhat more politely but firmly, tells me to shut the hell up! It’s over. Move on. So I moved on. And I had to move on quickly. Between trying to pay attention to the field from behind the bench, scanning the sideline for anything worth reporting and trying to pay attention to and decipher the language of the production people in my ear, the first half was a blur. At halftime, I exhaled. The second half also moved quickly but I was able to settle down and take everything in. There was an injury at one point and I told the guys in the booth and let them know the trainers were icing the guy’s knee on the bench. They said thanks and keep us updated. I will do that, I thought. I will keep you updated. I felt important. The day was beautiful. The stadium was rocking. I had found my groove. It was a beautiful day in Tuscaloosa. Then the strangest thing happened. It was late in the game. Only a few minutes left. And suddenly, something happened on the field that got my sideline very, very excited. The players around me were jumping and screaming and going crazy. But the stands were eerily quite. Then I started getting instructions in my ear. They were telling me if this score held up, as soon as the game ended, I needed to find Ole Miss head coach Billy Brewer and get him to midfield for the post game interview. Ole Miss had taken the lead. But I didn’t have time to process it because I started freaking out a little about this new responsibility. Which one was coach Brewer? What do I say when I find him? Do I keep my headset on when I go get him? No, that’s dumb. Calm down Brian. Let’s try that breathing thing again. Nothing to worry about. Besides, the game’s not over yet. But in the last few minutes the Alabama comeback attempt failed and Ole Miss scored again. The game was indeed over and I had a job to do. My adrenaline was pumping. Players were going crazy. People and press came from everywhere and we all poured onto the field. Do you have any idea how hard it is to locate one person in the middle of that chaos? But I fought my way through and was able to catch up to coach Brewer just as he was shaking hands with Alabama coach Bill Curry. I took coach Brewer by the arm and led him to midfield. As we walked we were surrounded by players and media and I congratulated him on the win. For years I had a VHS tape of the game with the shot of me walking with him. I wish I knew what happened to that tape. Coach put on a headset and was interviewed by the guys in the booth. It lasted a couple of minutes and then it was over. See. Nothing to worry about. We still had a couple of hours of breaking down to do but even that went quickly because I was still pumped up from the excitement. When we finally did finish, we got our checks and I headed home. And I was in for a little shock. My apartment was in walking distance of the stadium. I practically bounced home and instead of going to my place, I went to the apartment downstairs where we all gathered after games. I popped through the door and… the place was like a morgue. A group of depressed friends sat around the room, beers in hand, not saying a word. I sat down and it was then I started to process what I couldn’t process earlier. 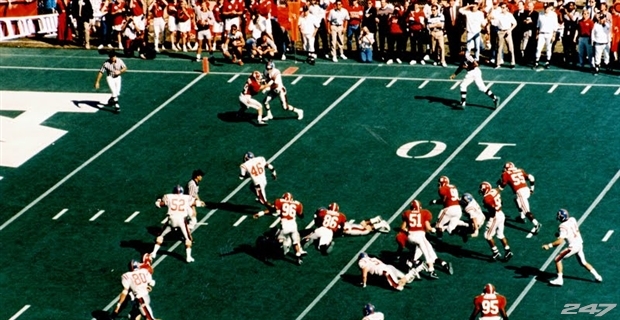 We, The Alabama Crimson Tide, had just lost our homecoming game to Ole Miss. Going back to 1900, the Rebels had never beaten Alabama in the state of Alabama. Never. And it was homecoming. This was an upset that was very upsetting. And I should have been upset too. If I had been sitting in the stands for the game, like I was every Saturday, I would have been depressed. But I wasn’t. The day was too much fun. In spite of, and partially because of, my screw-ups and inexperience. I was inside the same stadium, watching the same game but I had a much different experience. Television changes things. Changes what you see and how you see, whether you’re making it or watching it. Sometimes for better, sometimes for worse. Turns out, television production is not always that much fun and the day to day didn’t hold my attention very long. I changed majors 2 or 3 more times and bounced around a couple of other jobs and didn’t get back into television until 10 years later. Oddly enough, sports was once again the reason although that’s not what I do now. I’ve been working in TV for over 12 year now and while I’ve had some fun, I have yet to have another day like that Saturday in October. Great story Brian. I really enjoyed reading it.